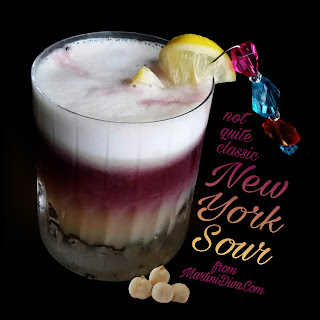 Is this a vegan New York Sour? Well, I'm not sure about the other ingredients, but what I used as my egg white substitute is certainly vegan! I enjoy a good New York Sour but when I'm out of fresh eggs I'm usually out of luck. That was until I found out that my dusty can of garbanzo beans (chickpeas) in the cupboard contains an excellent substitute for egg white. That's right, the liquid those chickpeas are canned in is called aquafaba and it works just like eggs in recipes. In 2014 French Chef Joël Roessel discovered that the liquid from canned beans can be used to make foams much like egg whites does*. In 2015 Goose Wohlt found that this liquid could be substituted for eggs for in vegan recipes. Good on ya, boys, I tip my eggless happy hour hat to you! The aquafaba is a perfectly respectable vegan substitution for egg white in a cocktail and it creates a beautiful foam as well. However, I did notice that as the ice melted in my drink the silky mouthfeel of a typical egg white cocktail became somewhat dissipated in the aquafaba version and the foam went a bit flat as well. 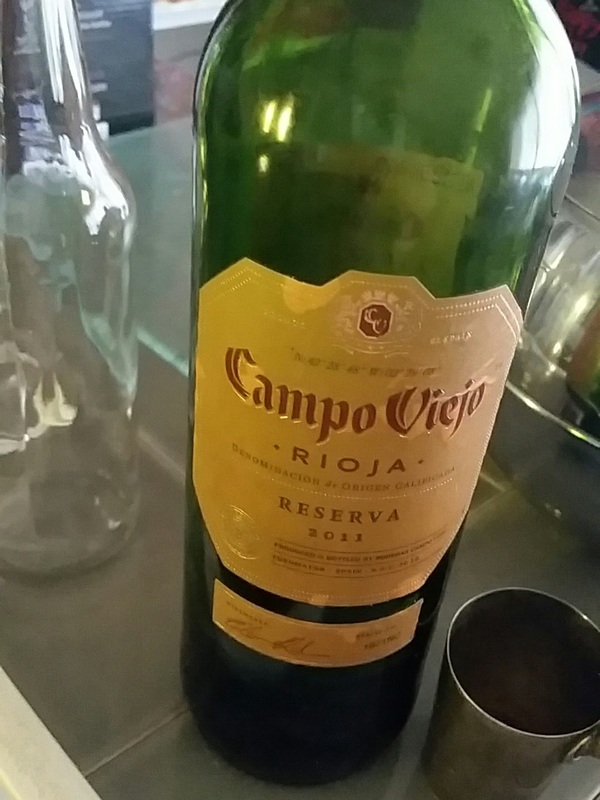 But the drink was still delicious and I was pleased with the overall results. Do I prefer it over egg white? No, but I'll make darn sure I always have a can of garbanzo beans in my cupboard just in case I'm ever out of egg whites again at happy hour. Just a note; when you open your can of garbanzo beans and strain out the liquid, you might notice a slight odor. I just left my aquafaba out for a few hours and that odor did not transfer to the finished cocktail. Even when using egg whites you must often tap on bitters or a dusting of spice over the top of your drink two mask the smell of the raw egg. By the way, 2 tablespoons of aquafaba is equal to one egg white, 2 tablespoons is 1 ounce. Perfect. 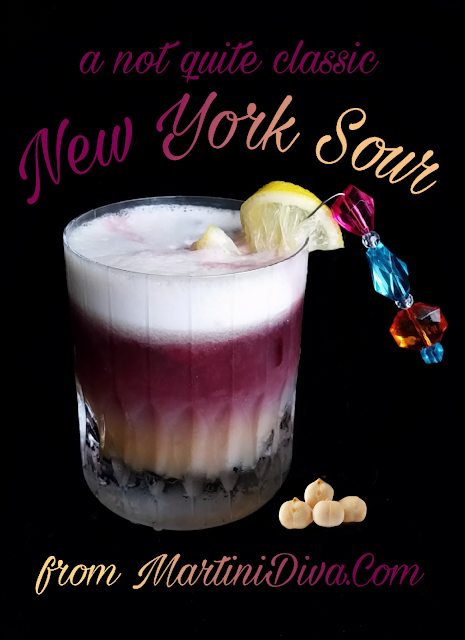 The Not Quite Classic NEW YORK SOUR INGREDIENTS 2 Oz. Bourbon (or Rye) 1 Oz. Fresh Lemon Juice 3/4 Oz. Blood Orange Honey Simple Syrup* 1 Oz. Aquafaba 1 Oz. Dry Red Wine** Garnish: None necessary but I wanted to show off my new cocktail pick so I slid on a lemon slice. Tools: Blender, Cocktail Shaker, Hawthorne Strainer, Bar Spoon Glass: Old Fashioned DIRECTIONS * To make the blood orange honey simple syrup, mix 2 tablespoons of Honey Ridge Blood Orange Creme Honey with 1 tablespoon of hot water. Add the bourbon, blood orange honey simple syrup, lemon juice and aquafaba to the cocktail shaker then dry shake (shake without ice) for several minutes to emulsify the aquafaba. Add ice and shake again to chill the cocktail. (I cheat and put the ingredients in a blender then blend on high for 2 or 3 minutes to emulsify, both methods also create the classic foam top. Then I transfer this to a cocktail shaker filled with ice and shake until well chilled.) Strain into a chilled glass, then pour the wine slowly over the back of a bar spoon to float on top. ** I prefer a Malbec or a nice Rioja in my New York Sours, last night's version got a float of my leftover Campo Viejo Rioja, Reservation 2011.